The recent erratic weather conditions in the UK have left local authorities looking for new solutions to help towns in areas of high risk to cope with heavy rainfall and the possibility of flooding. IBS Engineered Products, a specialist in the design, supply and installation of flow control and flood protection equipment, is now working within these communities to establish preventative measures to help combat the devastation that these natural disasters cause. 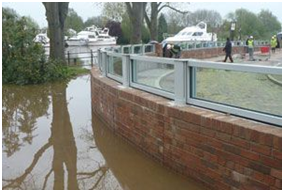 Named ‘the most flooded area in Britain’, the small town of Upton-upon-Severn has recently seen the installation of a new glass flood protection system as part of its £4.5 million flood alleviation scheme. The design process spanned almost two years, with the team aiming to create an effective preventative structure that did not compromise the aesthetics of the surrounding picturesque riverside location. This resulted in the construction of a 0.5m high, 173m long glass wall that looked to prevent any repeat damage that could occur in the event of another flood. Following a similar event, another glass structure was constructed in the northern town of Keswick, Cumbria, measuring 117.5m long and 0.8m tall (94m² in total). This structure will prevent the devastation caused by flooding, aiming to help protect the 180 homes in the area as well as other towns downstream. Again glass was chosen as the material of choice, a preventative solution that ensured that the attractiveness of the area was not concealed from its residents. 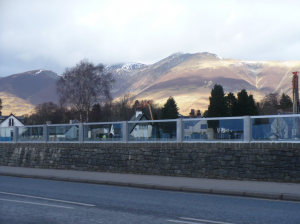 For more information on the successes of the Keswick barriers, please watch the below video. The barriers themselves consisted of four panes of glass laminated together, providing a surface that would be strong enough to withstand the pressure of water in a flood situation, along with the additional loads created by floating debris. Pilkington Activ™ self-cleaning glass was selected as the outer layers of the barrier, with a low-iron extra clear glass making up the inner two layers. Structures of this size can require a high level of maintenance; therefore it was a natural decision for the construction teams from both areas to choose Pilkington Activ™ - self-cleaning, as it helped reduce the need for regular upkeep, as well as saving on time, energy and money – an essential benefit for the small communities. Pilkington Activ™ uses the forces of nature to maintain a cleaner and clearer appearance, integrating a dual-action process where organic dirt is broken down by daylight and then washed away by rain. Thus a process that is environmentally friendly and very easy to maintain. For more information on both these project please visit IBS Engineered Products, alternatively for information on our self-cleaning glass, Pilkington Activ™, please visit our official website.